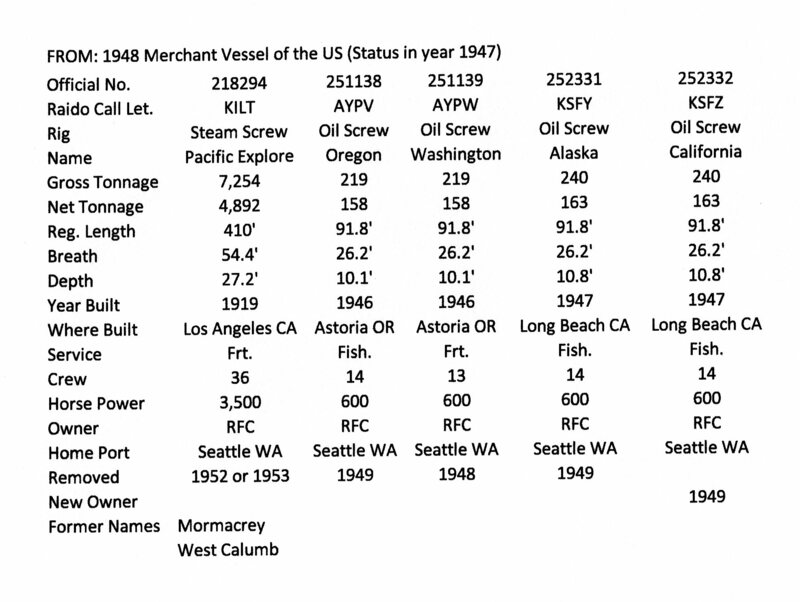 All five Reconstruction Finance Corporation (RFC) vessels in the Pacific Fishing Project are listed in the1948 volume of the Merchant Vessels of the United States (MVUS) (1) and the information on each is shown in the accompanying table. 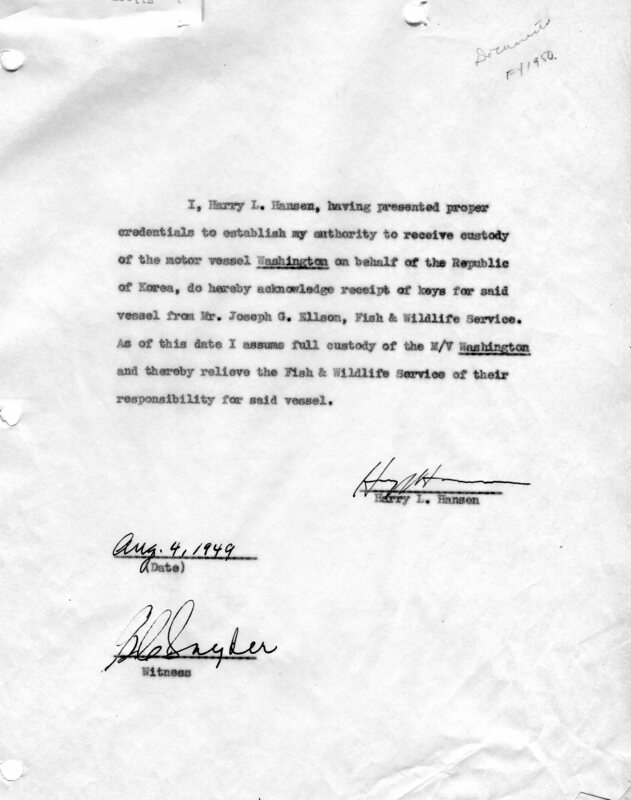 Their status is actually what they were during the previous year, 1947, since the cutoff date for the volume was Jan. 1, 1948. The Service of the four fishing vessels in the list should all be the same, but for some reason Washington is listed as a freighter (Frt.). It differs from the Oregon, Alaska, and California by having six brine tanks instead of two, a narrower central hatch and four additional hatches for access to them. 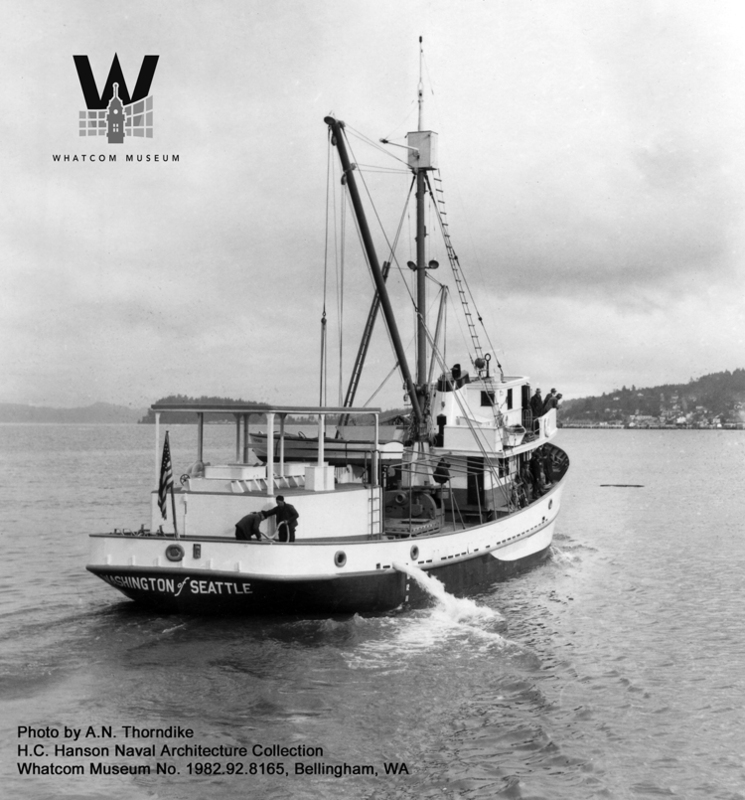 Jeff Jewell, curator of the Whatcom Country Museum’s (WCM) H. C. Hanson Naval Architecture Collection, produced a photo of the Washington which was taken on her trial run in the Columbia River after she was built in Astoria, Oregon in 1946. In it the central hatch cover extends out from the starboard side of the winch, clearly indicating that the additional brine tanks were added to the vessel after she was built. I think they were getting her ready to explore South American waters off Peru and Chili with her sister vessel California. Tom Dunatov, a good friend of mine who was first mate on the John N. Cobb from 1972 to1980 and then the skipper from 1981 to1990, fished on a tuna vessel out of California when he got out of the Navy in 1957. He told me that during that time brine tanks were commonly used in the tuna industry to carry extra fuel on long trips to the fishing grounds off Central America. Once they arrived the fuel that was used on the trip down would be replaced by the fuel in the brine tank, the tank emptied, cleaned out with detergent and refilled with sea water. The temperature would be brought down to freezing and as fresh fish were taken they would be placed into the tank of freezing water. Adding more salt to the mix would bring the temperature down even further so the fish would be completely frozen. When the tank was full of frozen fish the brine would be pumped overboard and the fish moved to the refrigerated hold where they would be held frozen. This increased the holding capacity of the vessel by reducing the space between fish. The tank would again be refilled with sea water and the process repeated until the vessel was packed full of frozen tuna. Brine tanks could carry extra fuel for both vessels on their long trip to South America and to bring back frozen catch. This possibly explains why the four extra brine tanks were added. 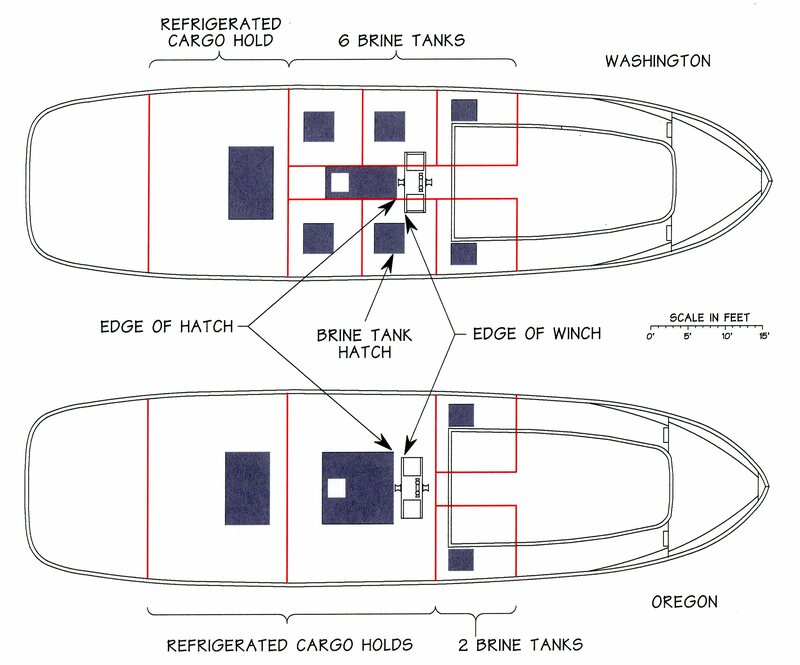 The vessels had a capacity of 36,800 gallons of fuel in four wing tanks and the double bottom tanks (2). If the six brine tanks on the Washington were filled with fuel which would at least double the fuel capacity, it could be used to replace the fuel used in getting to South America and to complete the survey of both vessels and returning home. Apparently this was a planned scouting venture to see if it would be worthwhile to send the Pacific Explorer to the far south for her third trip, like the Alaska’s exploratory trip to Bering Sea in 1947 before the Pacific Explorer’s second trip to the Bering Sea in 1948. Washington and California were crewed up and ready to go and were scheduled to sail in 1948 to explore the waters off the coasts of Peru and Chili, but those were canceled at the last moment. 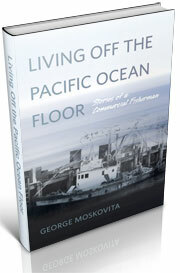 When the entire Pacific Fishing Project was terminated at the end of 1948 each of the RFC vessels’ status changed in the MVUS yearly book. 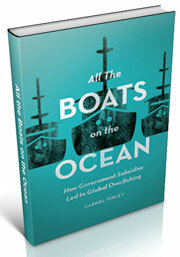 If vessel ownership is transferred to the government it is removed from the list. If a vessel is scrapped it is removed from the list and if it is transferred to a new owner, the owner’s name changes. Washington was transferred to the government in 1948, along with the Oregon and Alaska in 1949. The California was apparently traded for Southeastern in 1949, since the ownership for the California became Joe Bterskovich and the ownership of the Southeastern became RFC and then was transferred to Del-Mar Foods Inc. in 1950. Pacific Explorer was last listed in the 1952 volume after which it was removed because it was scrapped. 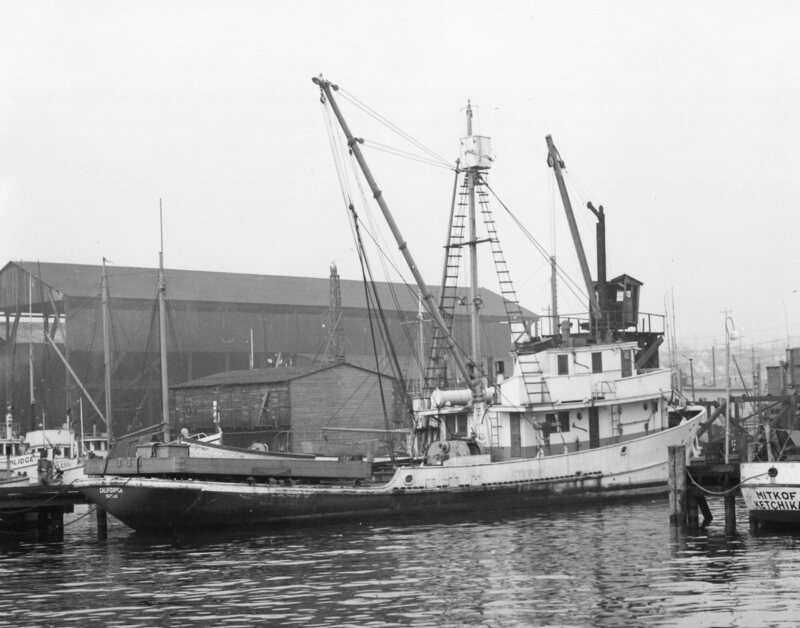 Funds became available on July 1, 1948 for an exploratory vessel and its operation in the northeastern Pacific and this was the start of the FWS Exploratory Fishing and Gear Research Base in Seattle. The Washington became a FWS vessel and sailed on her first exploratory cruise to the Bering Sea in August and returned in October, 1948 which, in fact, was her first since she was built. Based on the experience that was gained on this trip, the FWS decided that instead of making necessary modifications to the Washington a new design should be made and a new vessel built. The Seattle firm of W. C. Nickum and Sons was selected to design the John N. Cobb, a dedicated Exploratory Fishing and Gear Research Vessel. I had always believed that Washington was one of those vessels moved to China through the United Nations Relief and Rehabilitation Administration (UNRRA). China was undergoing an acute food shortage after World War II and the plan was to supply fishing boats and a training program to teach how to fish them. 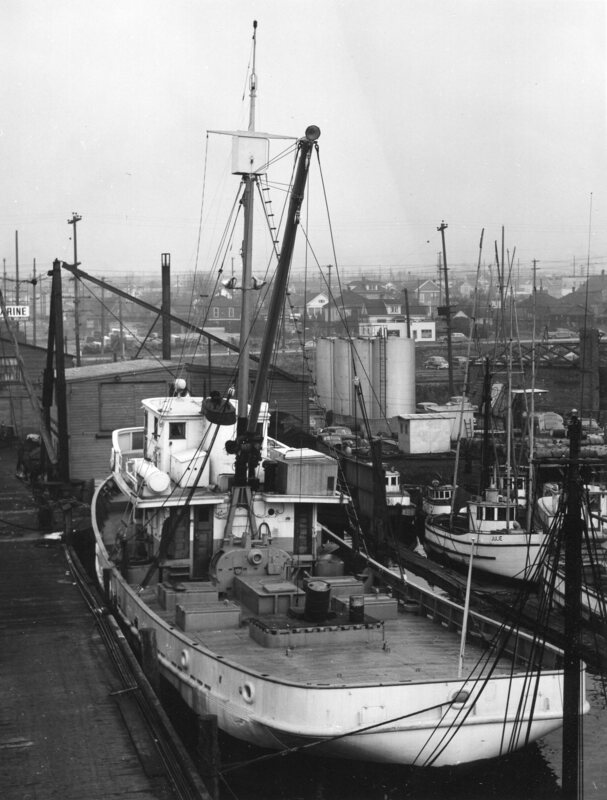 At least four convoys of fishing boats sailed from the Pacific Northwest coast of the United States in 1946 on the southern route to Shanghai via Honolulu, Wake and Guam. 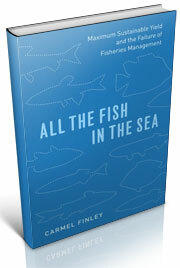 There were seven fishing vessels per convoy, each manned by a crew of seven. Tom’s dad, Joe Dunatov, was one of the fishermen on the E. E. Johnson that went in one of the convoys to China and he remained there for a short time as a teacher because of his extended knowledge of making and mending nets. He was the lead fishermen or bos’un on the Cobb from 1956 to 1968. That’s where I got to know him when I started going out on the Cobb in 1960. Tom said years later that his Dad was part of the crew that delivered the Washington, he thought, to the Philippines or Samoa. Mel Greenwood, in an article on the Exploratory Fishing and Gear Development, makes the statement that “The Washington was not suitable for the kind of work needed and was sold for $150,000” (3). When I was going through the old exploratory cruise reports I came across a receipt for the Washington dated Aug 4, 1949, which showed that it went to the Republic of Korea. The Oregon became the FWS’ second exploratory vessel. Alaska was transferred to the State of California as a research vessel, and the new design for the John N. Cobb was approved and the bid to build her went to Western Boat Building Co., Tacoma, Washington. 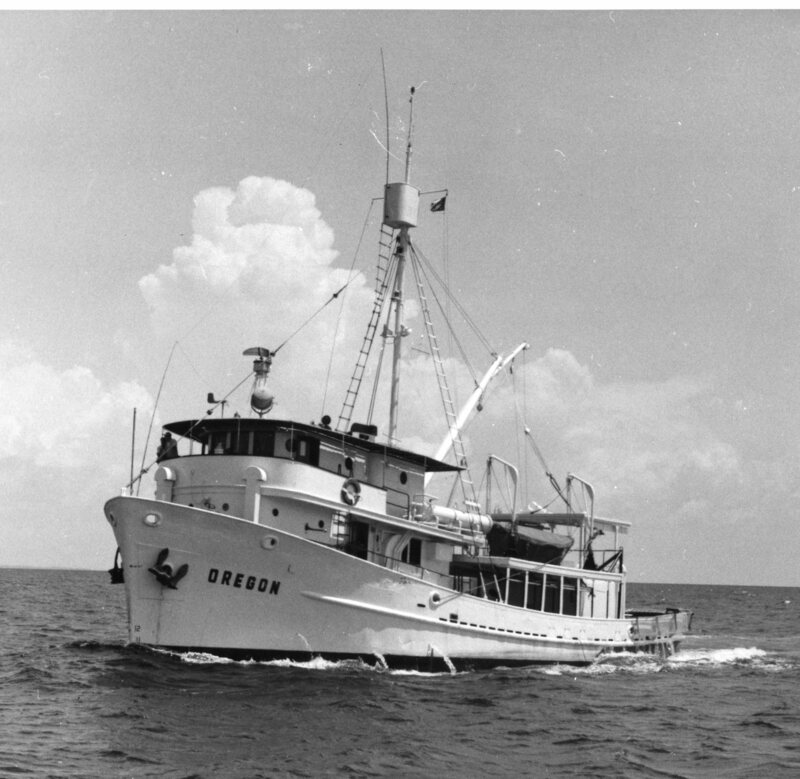 Deep Sea was chartered for the second exploratory cruise and the Oregon was used in the third exploratory cruise, after which she departed for Pascagoula, Mississippi where she would be used to explore the Gulf of Mexico. 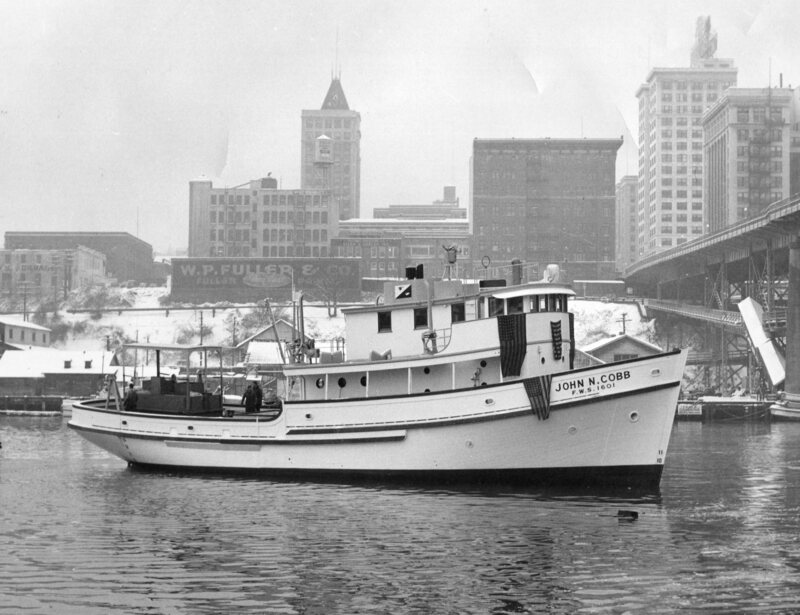 The new vessel John N. Cobb was launched and commissioned in January 1950 as a dedicated research vessel for Seattle’s Exploratory Fishing and Gear Research Base. She sailed on the fourth exploratory cruise to Alaska in March. 1948 Annual List of Merchant Vessels of the United States. U.S. Department of Commerce, Bureau of Navigation. Hanson, H. C. 1955 Pacific Combination Fishing Vessels. In Fishing Boats of the World, FAO, Fishing News London England, pp 187-202. Greenwood, Melvin R. Exploratory Fishing and Gear Development; pp 107-130; In U.S. Department of Commerce, NOAA Technical Memorandum NMFS F/NWC-34; Fifty Years of Cooperation and Commitment 1931-81, The Northwest and Alaska Fisheries Center; Edited by R.R. Mitsuoka, R.E. Pearson, L.J. Rutledge, & S. Waterman. October 1982. 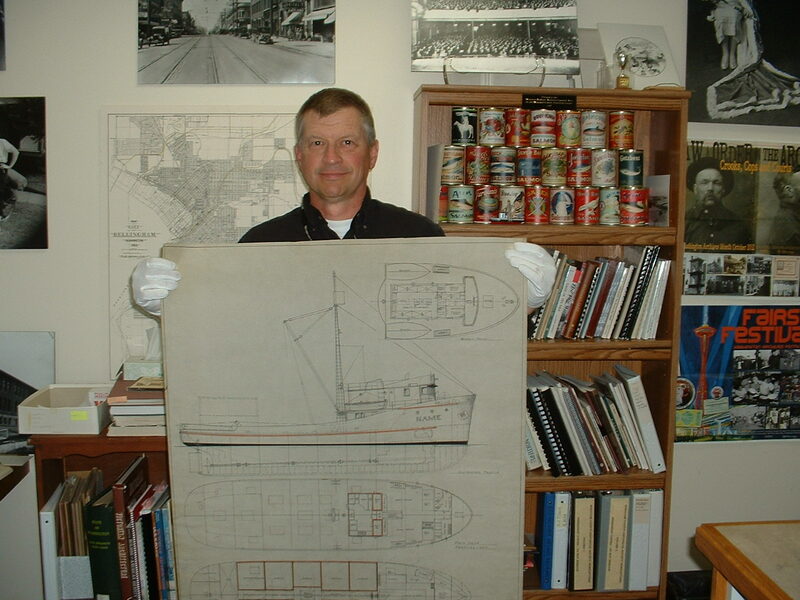 This entry was posted in boat building, Environmental History, Exploratory Fishing Base, fisheries science, Fishing, History of Science, History of Technology, Nick Bez, Pacific Explorer, Pacific Fishing History Project, R/V John N. Cobb. Bookmark the permalink.